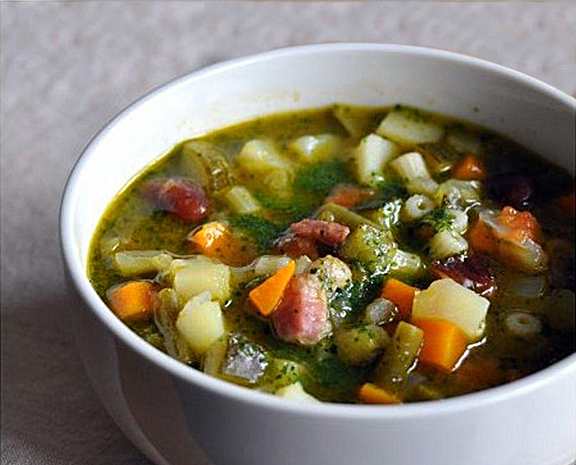 Genovese Minestrone. One fine vegetarian meal for a crowd. One person had difficulty with the acidity of tomatoes; another was a vegetarian. What to do...what to do...? So I thought and, with some significant help from my friends at Google, I cobbled together this recipe. It was a huge hit. Not only did it satisfy everyone's needs, but it also was tasty and filling. For the carnivores I even thought up a satisfying solution that didn't contaminate the main dish. I fried some pancetta and served it as a crunchy addition for our guests to sprinkle on top of the soup if they chose. That was good....mmmmmmm. 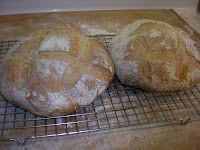 I made some Pughliese bread to round it all out. 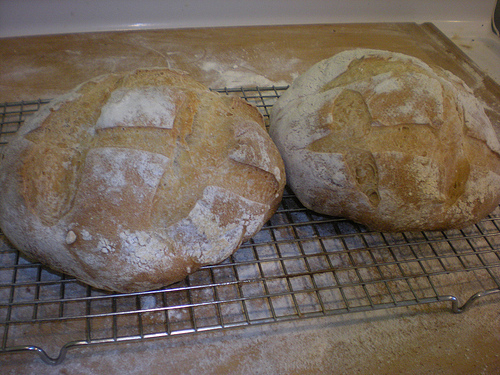 The fresh baked loaves filled the house with a homey aroma, and the steaming bread was enjoyed as I was finishing the soup. This recipe is the kind you can set to simmer and leave to enjoy your friends. Heat olive oil over medium high heat in a dutch oven. Add garlic, onions, celery and carrots and sauté until onions begin to soften. Add broth, wine, black and green beans, spinach, squash, oregano, salt and pepper. Bring to a boil, cover, reduce heat and simmer for 40 minutes. Add in pesto and adjust salt to your liking. If making ahead, simply stop at this point, then reheat the vegetable mixture and continue with the recipe. While vegetables are cooking, sauté pancetta until crisp. Reserve rendered fat to add to the vegetables if you wish. Cook the pasta according to package directions and stir in to the vegetables. To serve, ladle soup into bowls and top with the pancetta and parmesan. If you like this post, feel free to retweet it with the link at the top right, or share it using any of the links below. One of my favorites, and there are a few. Blessed to have a high metabolism!